Firstly, combine all ingredients in a bowl and mix well. Then heat a pan and grease with some coconut oil. Pour batter into skillet and move it around so it spreads out thin. Once the batter starts slightly bubbling flip the crepe and cook on the other side for another minute. Then transfer on to a plate and repeat the process until you use up all the batter. Finally, stuff with your favourite toppings and serve. Firstly, start off by cooking the eggs and bacon to your liking. In the meantime, in a medium sized bowl mix together the spinach, olive oil, vinegar and season with salt & pepper. Then rub the olive oil and seasoning into the spinach leaves for 2-3 mins. After that, divide the spinach between two bowls, top with halved eggs, chopped bacon, tomatoes, and avocado. Finally, season with salt and pepper before serving. And there you have it, breakfast recipes that are delicious, easy to make, and taste frikkin’ great! 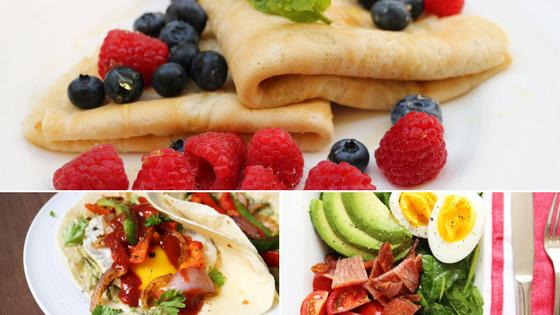 So I hope you enjoy whipping up these meals for your next breakfast. If you do, tag me in those pics on Instagram!